Define your own H3 meta tags. In this version you can define your own H3 meta tags in your topics. This includes Help IDs. Previous versions would clear all H3 Meta tags before processing and generate new topic Help IDs using GUIDs. So now you can give your topics permanent HelpIDs, keywords, categories, F1 keywords etc. Although TocParent and TocOrder wont stick because Migrate uses the TOC structure of your projects HxT or HHC Table Of Contents files. Check the new option "Keep H3 Header Tags" (see screen capture below). When checked, file processing will take a little longer to complete since all topic files need to be scanned for pre-existing Help Ids. You can now pre-define H3 meta tags including Help IDs tags in your topic files. Simply write them in the normal way. 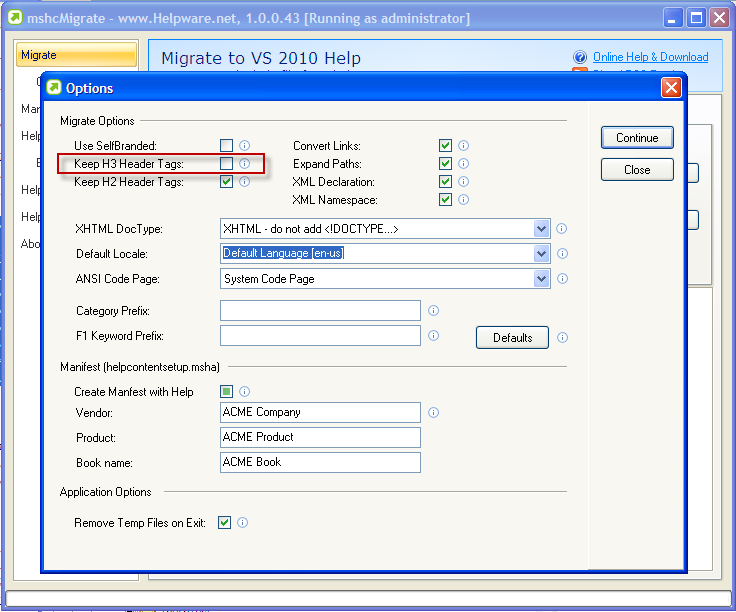 Previously Migrate wiped any existing H3 tags from topics before adding the required tags. Option "Keep H3 header tags" allows you to keep H3 Help IDs defined in your topics. Rework the file list code to accommodate this change. Shift+click the Migrate or Update button to show the Options page in a dialog box before processing begins (see screen capture below). Fixed: Code where <title> tag was isolated to a single lines. Kept adding line feeds even when not required. Checkboxes were not showing focus lines under themed Windows. We now show focus using underline. Convert local hyper links to ID links -- Now includes image map links (However looks like HV 1.0 does not understand these links). Added test links to open the current Catalog on 3 pages.